KEEP YOUR BABY HAPPY & HEALTHY - Helps your baby sleep while also protecting them from bugs, germs, wind and sunlight. Create a cosy, comfortable and safe environment for your precious little one with our extra large custom made stylish and unisex car seat cover. 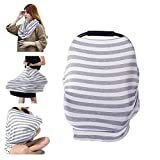 TRENDY HOT GIFT & SATISFACTION GUARANTEE: Best unisex gift for baby showers or simply a great present for any mom to be, new moms. If you are unsatisfied, let us know and we work with you until you are happy. LIFETIME MONEY BACK GUARANTEE: Completely risk-free satisfaction guarantee for life. If every anything goes wrong or the multi-use cover is not to your liking we offer an unconditional, hassle-free refund.